Play is positive; gaming is good; and online engagement has begun supplying a generation with the love and feelings of connection that all humans crave. Some 7 billion hours a week are being poured into to this alternate world of engagement through online games. And 25 percent of Call of Duty players call in sick the day a new version the game comes out. These amazing and concerning facts paint a picture of the new world of gaming, said Jane McGonigal, who delivered the opening keynote address Wednesday at the FETC 2015 conference in Orlando, FL. The first person to earn a Ph.D. in the study of the effects of gaming, she is director of Games Research & Development at the Institute for the Future, a non-profit research group in Palo Alto, CA. While parents worry their children spend too much time with computer games, McGonigal said gamers, young and old, derive many benefits from gaming. "We're going to spend a whole hour taking games seriously," McGonigal told the crowd of several thousand educators who attended the 35-year-old conference to learn about the newest technologies for educators. 300 million minutes a day are spent playing Angry Birds, which even McGonigal said she suspected was too much. "It's inevitable," McGonigal said. "Soon, we'll all be gamers." For parents aghast at the thought their children's minds are being devoured by gaming, McGonigal said that games supply tender nurturing support that has usually come from other sources. "Creativity is the No.1 emotion people feel when gaming," McGonigal said. "It actually creates strong relationships that many players experience as love. They want to feel awe and love." 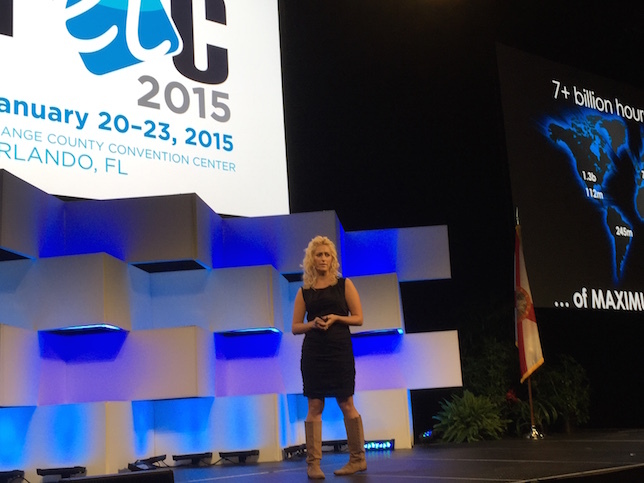 Premier game creator and scientist, McGonigal, assures her audience at the FETC 2015 conference of the benefits of online games. In the audience, the mother of a gaming teenaged girl learned to fear gaming less. 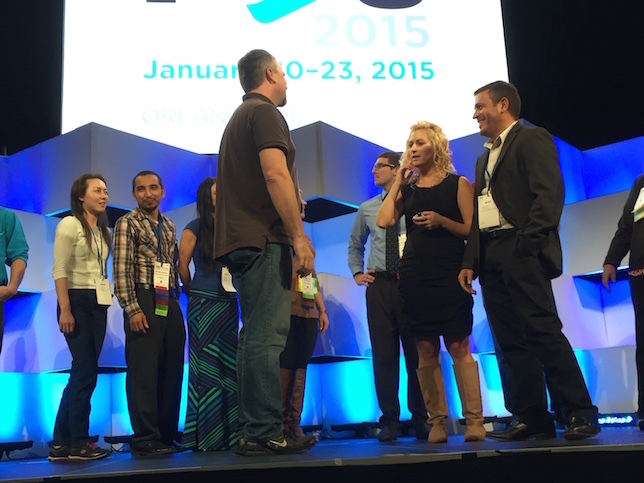 "I love the way [McGonigal] talked about gaming," said Amy Burkhead from Jay, FL. "Instead of leading the kids where we want them to go, she wants to let the kids go where they want to go." Burkhead has worried that her 15-year-old daughter gamed too much, even though she made good grades in school. "My child is a Call of Duty child. I'm 50. I'm trying to connect with her. She says, 'Mom, you need to do this,'" Burkhead said. "She's got diverse interests, but I never understood." McGonigal's Eureka! moment came after a severe concussion that caused depression, desperation and pain that would not go away. After hours of research seeking a cure, she created a healing game that allows the patient to reach out to family and friends for help with healing. "I didn't just get better, I got SuperBetter," McGonigal said about the discovery during a TED Talk. And that's the name of the interactive game she created that so far has helped a half million people harness the power of positivity to heal their bodies and minds. McGonigal, through gaming, has a new take on the philosophy of positivity, which, she claimed, can add years to people's lives. During the Wednesday presentation, she organized the crowd into a massive thumb war, a basic game where 10,000 hands were joined in competition and connection. The emotions created were curiosity, creativity, surprise, relief, excitement, joy, awe and wonder, love and pride. Participants gather for a game of thumb wars. "We had thousands of people physically connected for a moment," she said. Gaming could be the key to relieve some of the world's loneliness, fear, sadness and misery. For example, studies show some 81 percent of workers are not engaged at the workplace, and education is often counterproductive. "The longer you stay in school, the less engaged you become," she said. Some of those at the convention found a hopeful message in McGonigal's interpretation of games as a force for good. "When she started talking about the way games can be productive and useful and energizing, I felt much better," said Peter Haines, the principal of an online school in Grand Junction, CO. While Haines has been concerned that his children were playing games too much, he uses a game in his school to help students log into the school and complete their work. "I like games, and I think it's important to have that break and that diversion," Haines said. Many people assume that online games waste of time or are simply leisure for the idle, but McGonigal dedicates herself to convincing the public that games are a crucial part of what makes us human — a crucial part that doesn't get the attention it deserves. Games can strengthen relationships and improve family bonds, she said. Studies show that games help people reach their goals and that 30 minutes a day of playing games boosts mood, increases happiness and makes us more courageous and ambitious. Quoting a colleague, she said, "The opposite of play isn't work; it's depression."